Hermit crabs can live long lives if kept in a proper home. Their habitat should have everything they need to survive and thrive. By providing the correct tank, substrate, decor, sources of food and water, and proper humidity your pets can keep you entertained for years. Below is a list of items to create a wonderful home for your pets. A glass aquarium or terrarium with a screened lid makes an ideal home for hermit crabs. A 10 gallon tank has enough room for several crabs. A bigger tank would be needed for more hermit crabs. You can always go bigger than what is suggested. You pets will enjoy the added space to move around and explore. Wire cages are not recommended for hermit crabs. Although there are many commercially available, they are not always good homes. Wire cages do not hold humidity well and hermit crabs need high humidity to thrive. Hermit crabs need a warm and humid habitat to stay healthy. Use an under-tank heat pad to keep your pets warm. A large water dish in the cage will supply humidity. If more humidity is needed, using a water bottle to mist the tank with warm chlorine free water is an option. The cage temperature should be around 75 to 85 degrees and humidity should be around 60 to 70 percent. Avoid placing your pets’ home in direct sunlight, by windows, drafty areas, heaters, air conditioners, or any place with extreme heat or cold. Sand or a mix of sand and an earth substrate can be used as a bedding for your pets. There are several hermit crab substrates available from pet stores. Hermit crab and reptile sand is readily available and may even supply additional minerals that can aid in your pets’ health. Depending on the size of your crabs, the bedding may need to be quite deep. You want enough substrate to allow your crabs the ability to dig, burrow, and bury themselves completely. 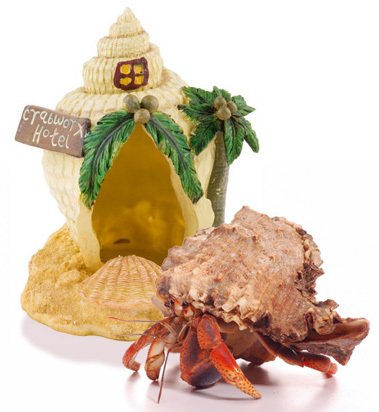 Hermit crabs like to climb so you should decorate their home with items that aid in their climbing. Branches, half logs, driftwood, caves, shells, coral, and many other types of pet decorations are available. You can make your pets’ habitat as simple or as extravagant as you like. Your pets will need food and water bowls. There should be a large water bowl available where they can get water, soak, and to supply humidity. The bowl should allow easy access into and out of the water. You will also want a second bowl for the supply of salt water you will offer your crabs. You will also need bowls for food. Multiple food bowls should be available to make sure everyone gets enough food. Heavy bowls are ideal to help prevent crabs from tipping the bowls and making a mess with their food. The tank will need to be cleaned weekly due to the humid environment. You should wash, thoroughly rinse, and dry the decor and food and water bowls. Check the substrate and remove any pieces of leftover food. Hermit crabs aren’t smelly, but their leftover food can rot and create unpleasant odors. The substrate should be completely replaced when it starts to smell, if you see signs of mold or mildew, or around every four to six months.